Where does Jimmy Carter live? Well, close your eyes and imagine the kind of house an ex-president of the United States might live in. The sort of residence befitting the former leader of the most powerful nation on earth. Got it? Right, now scrub that clean from your mind and instead imagine the sort of house where a moderately successful junior accountant and his family might live. It’s what in America is called a “ranch house”, or, as we’d say, “a bungalow”. There are no porticoes. No columns. No sweeping lawns. There’s just a small brick single-storey structure that Jimmy and his wife, Rosalynn, built on Woodland Drive back in 1961 when he was a peanut farmer and she was a peanut farmer’s wife, right in the heart of the town in which they grew up. Though Plains, Georgia is barely a town. A street, might be a more accurate description. A single road going nowhere much. At the end of the drive there’s a fleet of black Suburbans, giant SUVs with blacked-out windows: not too many junior accountants would have a crack team of secret service agents on site, it’s true. But it’s hard to overstate how modest it is. It’s not much of an exaggeration to say that the whole thing would fit comfortably into the sitting room of just one of Tony and Cherie Blair’s nine houses. In Britain we assumed that a politician that upright, that pure, could only be fictitious, and the expenses scandal has only reinforced that. But everything about Jimmy Carter’s life – what he did as president, and what he’s done since – has proved that “certain moral tone”. And his home somehow encapsulates this. Inside, there’s no hallway, just a patch of carpet separating a small dining room from a tiny sitting room. Then, all of a sudden, there’s Jimmy. Strictly speaking, he’s still Mr President, but it’s hard to give the office its true gravitas in what looks like my mum’s living room. And there’s a plain, homespun quality about him that’s reminiscent of that other great Jimmy, the patron saint of small-town American life: Jimmy Stewart. He’ll turn 87 in October, and is recovering from having both his knees replaced this summer, but the dazzling smile that once captivated America is still there. Though it’s a terrible cliché, not to mention patronising and ageist, to describe any octogenarian as “twinkly”, he undeniably is. It was even more of a political Siberia in the pre-internet age of 1981 when they first returned after Carter was defeated by Ronald Reagan. Wise came with them as their chief of staff. He recalls: “I was horrified when they said they were coming back here. I had to go and live with my parents. I thought they’d at least go to Atlanta.” Thirty years on, the Carters are still incredibly involved with the town. I stay in the Plains Inn, a former funeral parlour turned into a hotel – and decorated by Rosalynn – at the Carters’ instigation a few years back. One of my fellow guests works for the national park service at Carter’s childhood home, now a museum, and tells me that the Carters still pop by to pick vegetables from the garden. And on most Sundays Jimmy wanders down to the Maranatha Baptist Church to teach Sunday school. Jimmy’s early years on the family farm just outside Plains coloured his entire life. As a boy during the Great Depression, he recalls, “streams of tramps, or we called them hobos, walked back and forth in front of our house, along the railroad”. Even more influentially, it was a mostly black community. “I learned at first hand the deprivation of both white and black people living in a segregated community, which was then not challenged at all.” Except by his own mother; thanks to her liberalism all his earliest playmates were black. Politics was never on the agenda. He’s adamant about this, and when Rosalynn joins us she’s bemused at the idea that he had any desire to be president when she married him. What would you have made of it had you known? “I’d have thought it was tremendously exciting,” she says. “But totally ridiculous,” she agrees. The story of Jimmy Carter’s rise to power is, even 35 years on, still extraordinary. He truly was the man from nowhere. What was it, I ask Rosalynn, that enabled him to achieve the highest office in the land? “Well, he was elected governor after a long campaign…” she begins. “Well, it was not until you were governor that you ever dreamed of being president, I don’t think.” And she continues in this vein until he interrupts her again. It’s not the most glowing of encomiums, all things considered, but he seems just about satisfied with this. And he shows no sign of letting up. He travels to the world’s most intractable trouble spots as part of his work with the Elders, a group of elder statesmen (the caped crusaders of conflict resolution!) led by Nelson Mandela. In April he was in North Korea, trying again to negotiate an agreement on its nuclear programme – as he did successfully in 1994 when he persuaded Kim II-sung to agree to a nuclear weapons freeze. And this autumn he’ll be in Haiti, helping build 100 homes with volunteers from Habitat for Humanity, something he’s done every year for the past 30 years. He’s pioneered a model of post-presidential activism that Bill Clinton (or even ex-CEOs such as Bill Gates) have striven to emulate. And in 2002 he received the ultimate recognition for it: the Nobel Peace Prize. I heard, I say. Was there really never a master plan? Or, as Nicholas Dawidoff put it in a major profile Rolling Stone published of Jimmy Carter this spring, it’s because of Obama’s “scattered ambitions, his lack of a grand vision, his outsider’s discomfort with the ways of Washington, his fumbling economic policies… and above all his supposed lack of toughness, [that] the man he is increasingly compared with is Carter”. But as Dawidoff points out, Jimmy Carter is to Republicans what George W Bush is to Democrats: their very names make their enemies foam at the mouth. And the reassessment is working both ways. For years Carter was considered a failure because he was a single-term president, because he was perceived as weak, and because he refused to take action against America’s newly minted enemy, Iran. But, at this distance, the three great achievements of that single term seem even more of an achievement today: he forced through the Camp David Accords, one of only two peace treaties that Israel has ever signed, isolating Anwar Sadat and Menachem Begin at Camp David for 13 days until he gradually wore them down; he also forced through the Panama Canal Treaty, a deeply unpopular move that returned the canal to Panama, but which prevented, many believe, a difficult and nasty war in Latin America; and he brought in an energy policy that saw him reduce America’s dependency on imported oil by half. He was mocked – three decades before global warming became a fashionable concern – for walking around the White House, turning down the thermostats. It’s the second time we’ve talked about Blair. Money has disfigured American politics, Carter says. I ask him about the pledge he made the day after he lost his bid for re-election, when he told the press he would not make money off the back of his presidency. Is that true? Unlike Blair, I say. He’s made a fortune since leaving office. But then he doesn’t need to. His whole life has been a comment on that. It seems an impossibly long time ago, 1980. Prince Charles had just started dating Lady Diana Spencer. Dallas was the most popular TV show on both sides of the Atlantic. And Iran had recently been convulsed by the world’s first Islamic revolution. More pertinent to the story of Jimmy Carter, Islamist students and militants had stormed the American embassy in Tehran in November 1979 and taken 52 members of staff hostage. What could the US do? How could it save the hostages? It was a question that President Carter wrestled with for 444 long days. It paralysed the presidency. Carter refused to campaign for re-election, refused to light the White House Christmas tree, refused to bomb Tehran. Instead, he launched Operation Eagle Claw and, in a terrible confluence of extreme circumstances involving a sandstorm in the desert and a helicopter crash, eight US servicemen were killed. And no hostages were rescued. It was a humiliating failure. A failure his political career never recovered from. Nicholas Schmidle, in his New Yorker account of the covert Seals mission that killed Osama bin Laden in May this year, notes that: “Deploying four Chinooks was a last-minute decision made after President Barack Obama said he wanted to feel assured that the Americans could ‘fight their way out of Pakistan’.” In the event they weren’t needed (although the prime helicopter did crash in Bin Laden’s compound and had to be abandoned), but the source of his anxiety is easy to guess. If there is one thing President Carter wishes he’d done differently, it would be sending “one more helicopter”. The Camp David Accords were a massive political gamble. He risked failure, but he succeeded where no one has before or since. In 2006 he published a book, Palestine: Peace not Apartheid, that excited fury from the American right. Steven Hochman tells me: “He’s used to criticism. But I think it did hurt him. Some friends broke with him.” And yet it’s hard in Britain to understand what’s so controversial about the book. He recommends, as has pretty much everybody else who’s ever considered the situation, a two-state solution. “It does. It does,” he says. It’s one of Thomas’s most famous works, written as his father lay dying. He exhorts him instead to “rage, rage against the dying of the light”. No one, not the wise, nor the good, nor even the wild men, he writes, has ever done enough to be ready to die. Does that poem also have special significance too for Jimmy? He’s published his own poetry, too, along with many volumes of memoirs and a children’s book. On the way out of the room he points out his oil paintings. Some are more successful than others (he got round the tricky self-portrait issue by painting himself from behind) but he’s nothing if not a trier. Just not as much as they love each other. I find myself wondering about this. I’ve read Ronald Reagan’s diaries and observed how much he doted on Nancy; and Laura Bush’s memoirs, in which there’s no doubt that her marriage to Dubya is a strong and happy one; as, surely, is Barack and Michelle’s. A rock-solid marriage is almost a pre-condition of being elected president, it seems. But of all of them, none can match Jimmy and Rosalynn. I mention to Carter how Kelly Callahan had spoken of him as a true romantic. Jimmy and Rosalynn both answer at once. “I think he’s romantic,” says Rosalynn. They’ve always made a point of learning new things together. They have their Spanish lesson once a week. They climbed mountains, learned how to fly fish, went birdwatching. “I learned how to ski when I was 59 and Jimmy was 63,” says Rosalynn. So young Jimmy wasn’t sad to see the back of the beauty queen? It was love at first sight? I should be asking him for his views on Michele Bachmann. Or Binyamin Netanyahu. Or Kim Jong-il. But it’s terribly affecting, watching and listening to them both together. And if President Obama does turn out to have the “Carter Syndrome”, he might just need to count his blessings. I’m really not sure they make politicians like Jimmy Carter any more. If they ever did. 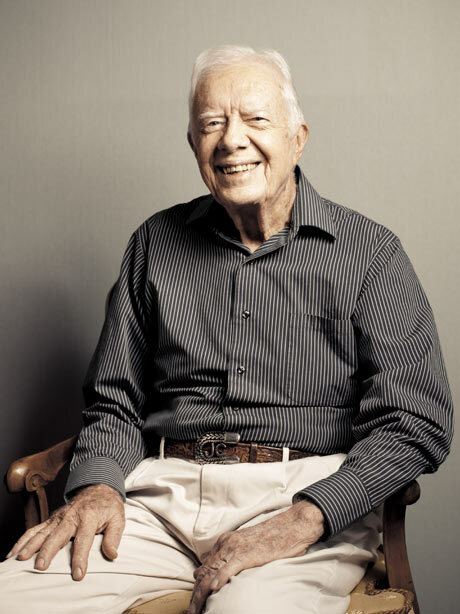 Photograph of President Jimmy Carter at home last month in Plains, Georgia, by Chris Stanford for the Observer.